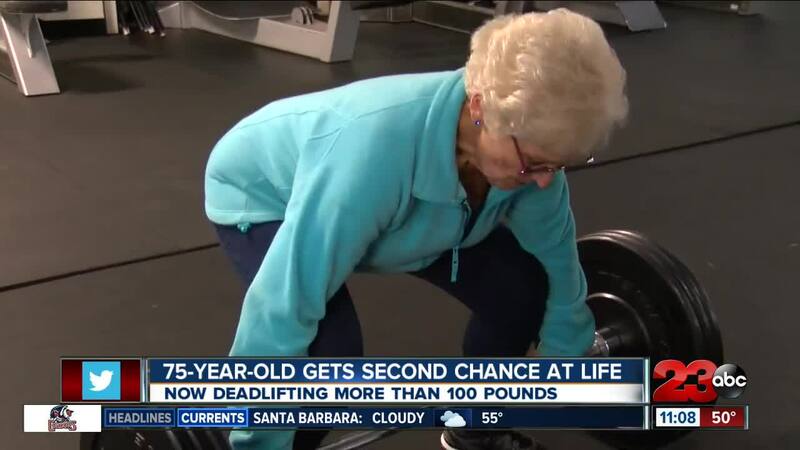 BAKERSFIELD, Calif. — At 75-years-old Bonnie Eichar is busting her bum in the gym three times a week. Her ultimate passion is dead-lifting. “My love is lifting," said Eichar. "I love coming to this gym and lifting because when I lift I feel so powerful." Eichar deadlifts 110 pounds and says she feels good and looks good, too. “When I lift, I’m squeezing my glutes, so after a workout...," laughs Eichar. "Jennifer Lopez watch out, here comes Bonnie Eichar." But, just nearly two years ago, Bonnie was a different person after finding out she had a 3 by 7 inch tumor. The tumor was pressing against her spinal cord and doctors said she needed a surgery that could kill her or leave her paralyzed. But, Bonnie woke up from that surgery and was more active than ever. “So, I walk in the gym and the first thing he says, 'well you have to get down on the floor,' [and I say] 'no way in hell, no, no, no, because if I go down, i'm not going to get back up,'" said Eichar. But Eichar and eventually lost more than 40 pounds. She says since she hit the gym she has a new life and perspective. “Life is happening for me," said Eichar. "I'm 75-years-old just discovering life. It’s the most exciting thing in the world and if I can do it [anybody can do it]. In eight months of training, Bonnie has went from dead-lifting 10 pounds to 110 pounds. “I love life as opposed to being prepared for death," said Eichar. I’m preparing for tomorrow, and this afternoon. It’s just exciting. I just want to grab everyone and say let’s get to the gym."